I’m Branching Out. This is my other WIP. I started it shortly after I received my Sockapaltwoza package. Showing you those fabulous socks is also on my blogging agenda, but for another day. This scarf is being knit with Phildar yarn that my sock pal sent me from France along with some other French goodies. I’m loving the yarn and the pattern. It’s just enough of a pattern to follow to keep things interesting, but easy enough to keep up with if I’m not paying attention. A new year always makes you think of the great things you can do with the year ahead. It’s a time of opportunity. When cleaning out my yarn closet recently, I realized that I have a bunch of leftover washable yarns that would be great for charity projects…blankets, hats, whatever. So, to add to my "reasonable" goals that I listed a few days ago, I would like to knit a charity project each month. 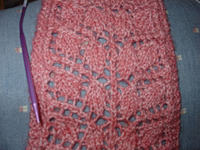 This could be a square for a blanket or a hat or scarf-sized project. On a completely unrelated note, this has got to be the longest week ever. Going back to work is hard. I’m not complaining because it’s nice to get into a routine again, but, while I enjoyed the rest I got over the holidays, it sure is hard to get back in the swing of things. glad you like the yarn, it looks lovely as a Branching Out scarf! I’m with you. It’s nice to have a routine back but I hate being at work. I miss my couch and my TiVo. Scarf looks nice. It *was* hard to get back into the swing of things this week!